George W. Drach MD received his medical degree at (Case) Western Reserve University, Cleveland, Ohio, and then spent two years in surgical training at University Hospitals of Cleveland. His training was interrupted by two years of active duty in the US Navy, part of which time was spent as Chief Medical Officer of the aircraft carrier USS Valley Forge. Upon returning to civilian activity, he completed one year of fellowship in urology (endocrinology) and three years of urology residency under Dr. William Boyce at Wake Forest University in North Carolina. He completed his training in 1969, and then spent 1- year at the University of New Mexico in a medical (infectious disease) fellowship. During the period 1970 - 1996 he resided at the University of Arizona, where he still holds the title of Professor Emeritus of Surgery/Urology and Founding Chief of Urology. From 1996 to 1998, he visited the University of Texas Southwestern Medical School in Dallas as Professor of Urology and directed the Urology Clinic at Parkland Memorial Hospital. Currently Dr. Drach is a Professor of Surgery (Urology) at the University of Pennsylvania. He is the author of over 100 journal articles, 33 book chapters and 3 books or monographs. He functioned as editor of the American Urological Association (AUA) CME Interactive Education series on Patient Management Problems from 1996 to 2003 and was Chairman of the AUA Publications Committee from 1985 - 1987. He has served nationally as President of the Western Section AUA, of the American Board of Urology, the Residency Review Committee for Urology, the Society of University Urologists, the Clinical Society of Genitourinary Surgeons and the Society for Research on Calculous Kinetics (the ROCK Society). He received the AUA Hugh Hampton Young (outstanding contributions to American urology) and Research Innovator (significant contributions to research) awards in 1986 and 1990 respectively. He served as the Study Monitor for the United States Lithotripter Study (Dornier, Inc. and the National Electrical Manufacturers Assn.) 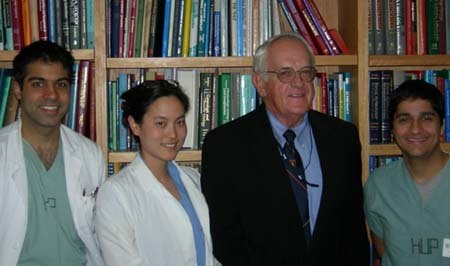 1982 - 1996, and received the honor of "Father of American Lithotripsy" in 1993. His major research interests include urinary stone disease, urinary and prostatic infections, mechanisms of urinary flow change with aging, and geriatric urology. As a result of this latter interest, he is now Chairman of the AUA Committee for Geriatric Urology, and President of the Geriatric Urology Society.